Actress and Paralympic star Katy Sullivan will be the Commencement Speaker for Webster University’s 2019 Commencement on Saturday, May 11, 2019, at The Muny in Forest Park. To mark this milestone 100th Commencement, Webster will award four honorary doctorate degrees to.. The Honorary Degree Committee is seeking nominations for the honorary degree recipient and commencement speaker for Webster University's 100 Commencement ceremony on Saturday, May 11, 2019, at The Muny in Forest Park in St. Louis. 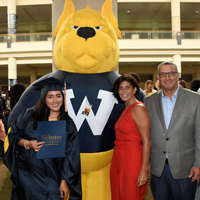 This annual ceremony is the largest gath..
Commencement season is underway and Webster University's campus locations in Florida got this tradition off on a celebratory footing with a celebration for graduates in Orlando on April 21. Glenton Gizean, president and CEO of the Central Florida Urban League, delivered ..